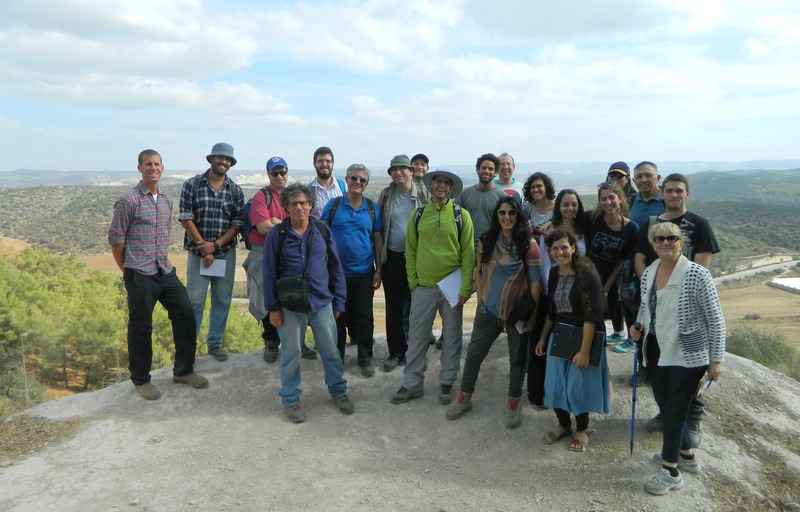 Just over a week ago, the Land of Israel and Archaeology department of Bar Ilan University launched its first “academic tour” of the semester, and I tagged along enthusiastically. 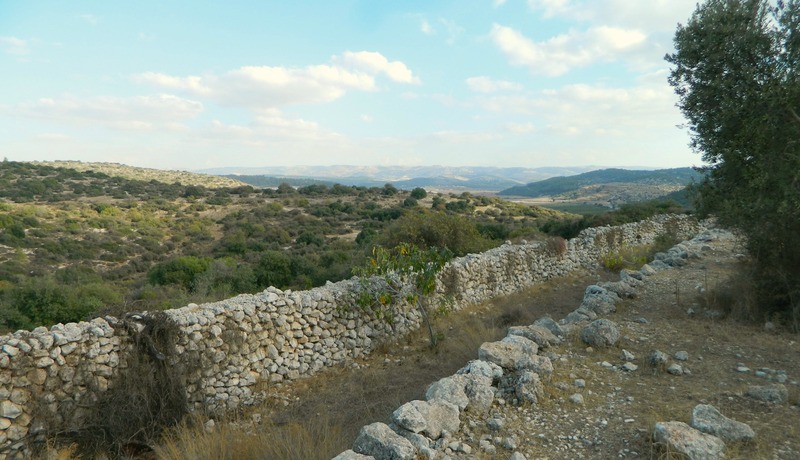 Our destinations were two predominantly Biblical (Iron Age) sites in the Judean foothills: Tel Azeka and Khirbet Qeiyafa. Leaving the university campus in the morning via minibus, we took a brief pit stop at Elah Junction before continuing on to our first site, Tel Azeka located in Park Brittania. Parking at the foot of Tel Azeka, we walked up the large mound from the south and crossed it to the eastern side, stopping under the Pistacia trees at the David and Goliath Lookout to enjoy the view of Emek HaElah (or, Elah Valley) where the legendary battle between David and Goliath took place. 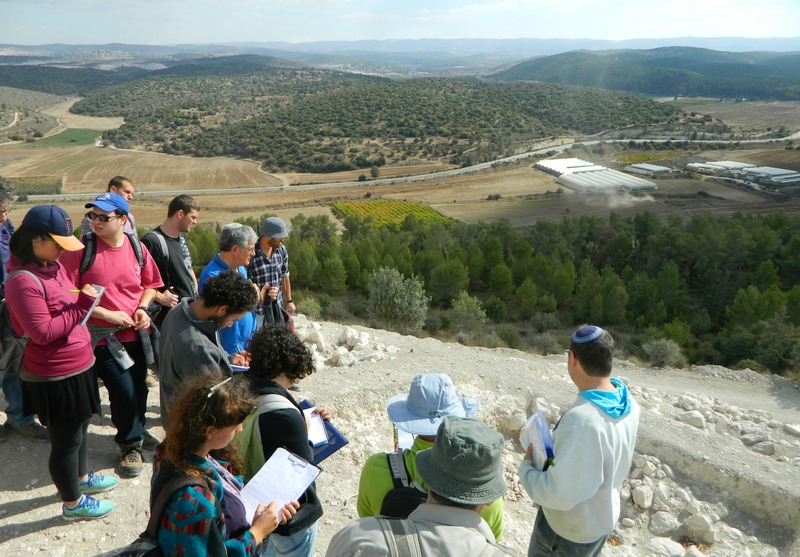 The first order of the day was an overview of the area from a topographical perspective, delivered by Dr Oren Ackermann. With the help of field maps and a compass or two, we were instructed in the many ways of topography, navigation and geographical orientation. As we sat in the shade I kept an eye out for wildlife down below – I was rewarded with sightings of a European robin, stonechat, kestrel and a whole lot of noisy Eurasian jays at Tel Azeka alone. 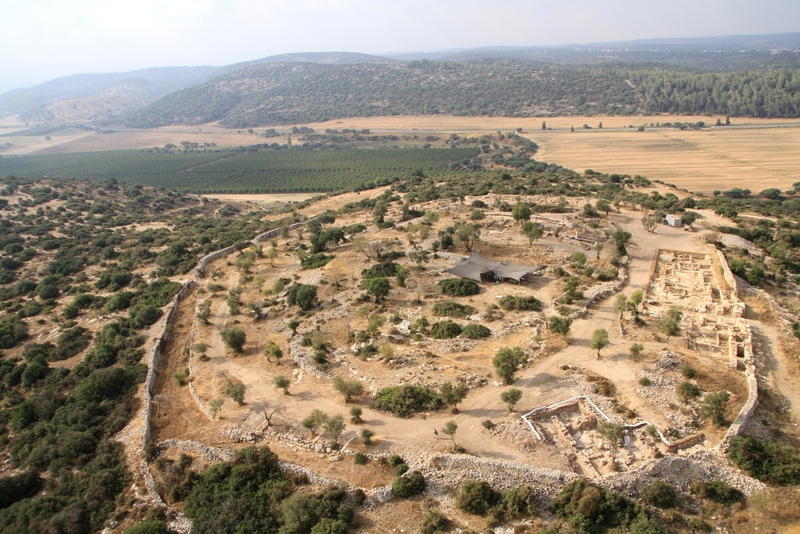 A brief history of Tel Azeka: First inhabited some 3500 or so years ago, the site is first mentioned in Biblical sources as a city conquered by Yehoshua (Joshua) – an epic tale involving hailstones and slaughter. Later, Azeka is mentioned as being part of the Israelite fortress line defending against the Philistines from the southwest. 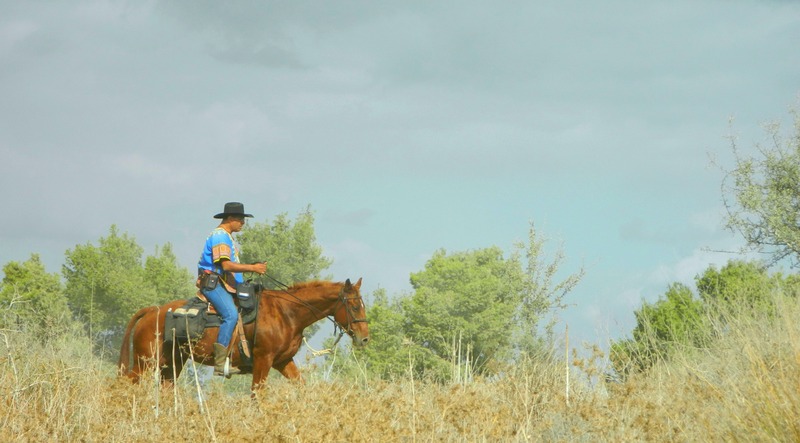 Being as that Emek HaElah is the natural entry-point into the Judean foothills region, hilltop cities were built and fortified to repel invaders. However, these bastions didn’t stop Sennacherib and his Assyrian army from conquering the Israelite cities all the way up to Jerusalem, including Azeka. The next superpower, the Babylonians, laid siege on Azeka and conquered it shortly before laying waste to Jerusalem. With the Jewish return to the Holy Land in the Persian period, Azeka was rebuilt and resettled, undergoing a name change in the Byzantine era; from Azeka to Caper Zacaria. Sometime thereafter the city was abandoned and fell to ruins, only to be discovered by PEF surveyors and archaeologists in the late 1800s. 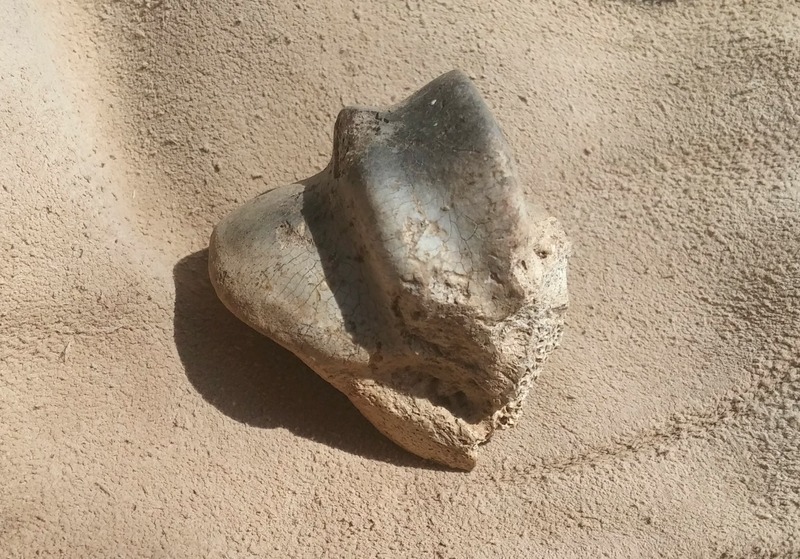 Over one hundred years later, archaeologists from Tel Aviv University began modern excavations – the next dig season set for July 2018 (see HERE). Returning to the narrative, we then stepped over the edge of the lookout to examine the unusually steep Assyrian siege batteries excavated out of the gravelly sides of the tel. From there we headed to the southern side and looked at the old city wall ruins of the Late Bronze to Iron Age period, before Israelite reign, under the shade of tall pine trees. Looping around the west side, we then stood at the edge of another open excavation, the Hellenistic palace. And from there we headed back over to the east side to take a group photo. Leaving Tel Azeka, we were then driven to the start of a dirt road not far below the tel, across Road 38, where we were to walk on foot to our next site: Khirbet Qeiyafa (debatably also known as Shaaraim, meaning “Two Gates”). 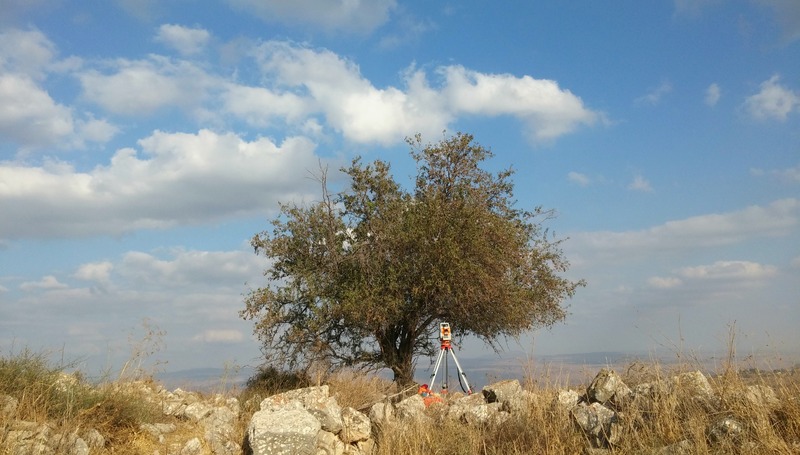 Mostly disregarded by surveyors in the 19th and 20th centuries, the site was identified as an important fortified city in 1992 and 2001, and most recently excavated between 2007-2013 by the Hebrew University under Professor Yosef Garfinkel and Saar Ganor of the Antiquities Authority. 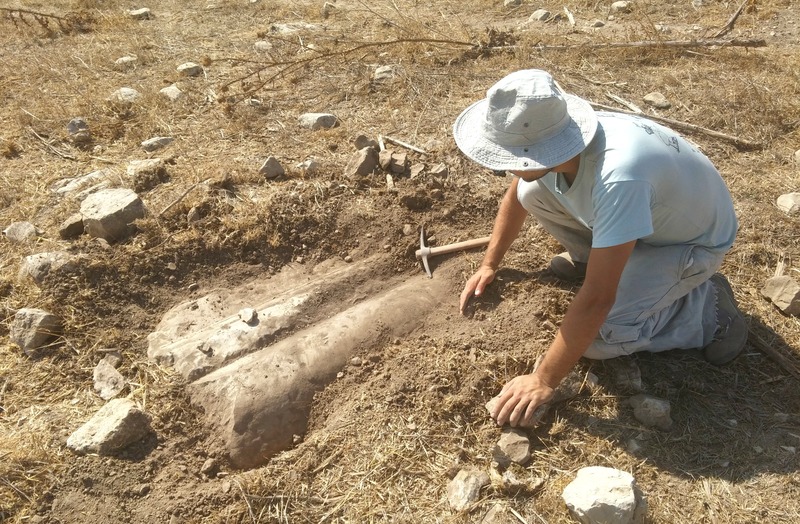 I had the honour of digging with these fine archaeologists six or so months ago at Khirbet Arai, located some seventeen kilometres southwest of Qeiyafa. To give an even briefer historical overview, Qeiyafa was a Biblical city, same as Azeka, perhaps the largest city in the area at the time. 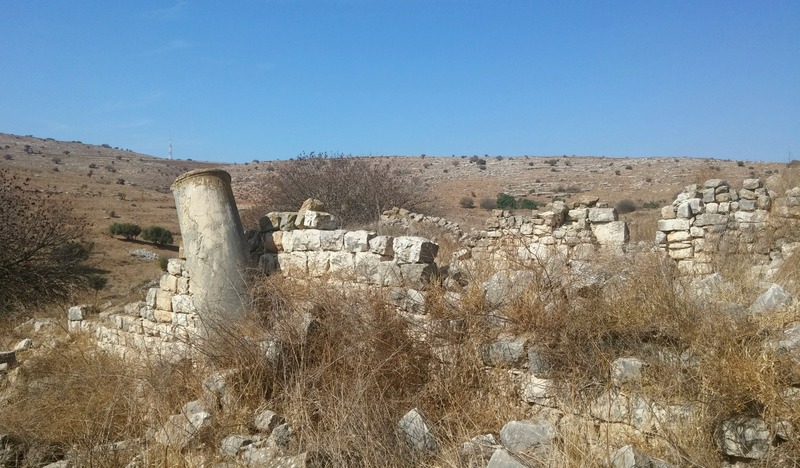 The findings of a second gate, facing south overlooking Emek HaElah, seemingly solidified the theory that Qeiyafa was the Biblical city of Shaaraim. In the Hellenistic period the site was fortified, with the addition of smaller fieldstones to enlarge the city walls. The Roman and Byzantine periods saw continued settlement, yet sometime afterwards the ancient city fell to disuse and was only scattered stone heaps until recent years. 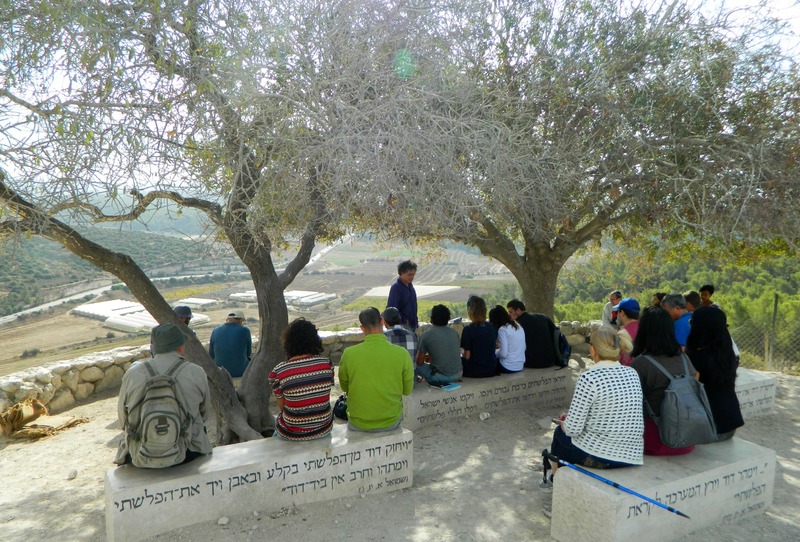 And so it was that our group of academics and students alike sat under the shade of an olive tree to hear about the recent excavations. Getting back up on our feet, we examined the four-chambered western gate and then took a slow loop within the city perimetre, pausing here and there for educational purposes. I was gazing about at the ruins around me when I saw the briefest of glimpses of a bird that I’ve never seen before. All I needed was that glimpse to identify a male blue rock thrush from the bird guide I carry around everywhere – an exciting spotting for me, even if I was unable to photographically capture the moment. 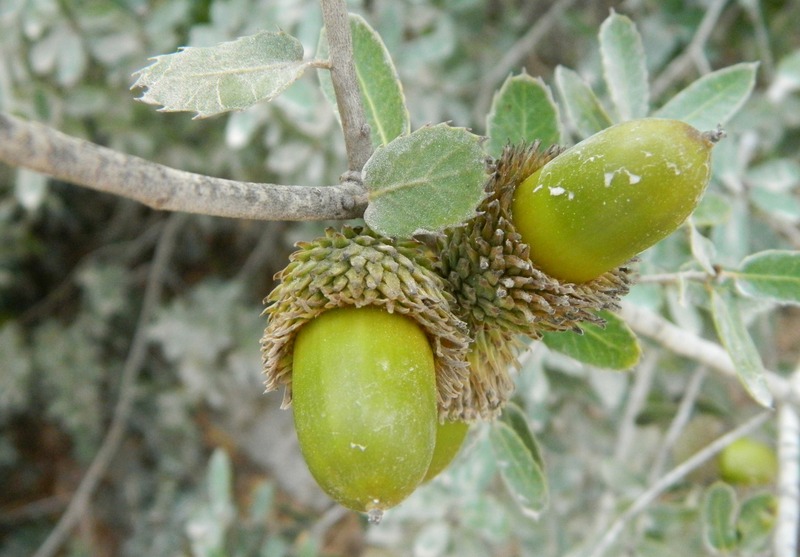 Finishing up where we started – the western gate – I found a bitter almond tree and tried to feed my friends cyanide-rich nutmeat, but they all refused. We boarded the minibus and drove through intermittent traffic back to the university, successfully culminating the first archaeology trip of the semester. Exactly two weeks ago, during Chol HaMoed of Sukkot, I took my brother Nissim to an archaeological dig at the nearby Tel Kedesh. 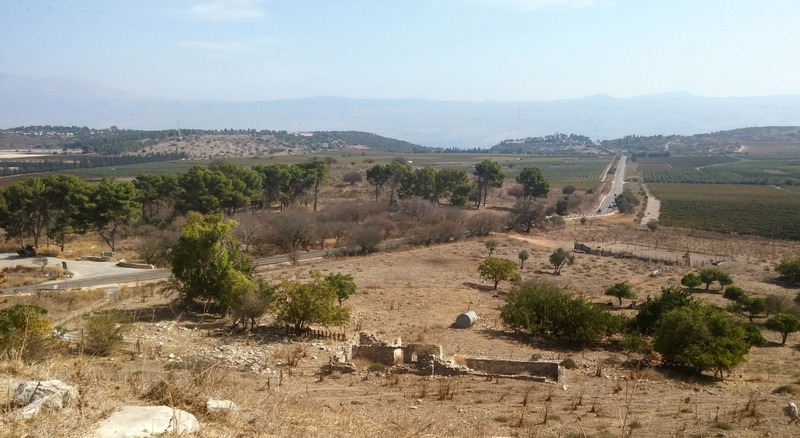 Located on the Old Northern Road north of Tzfat in the Naftali Mountains of the Upper Galilee, Tel Kedesh is just approximately 700 metres from the Lebanese border. I had visited half of the site two-and-a-half years ago with my sister (blog post linked in the first sentence). 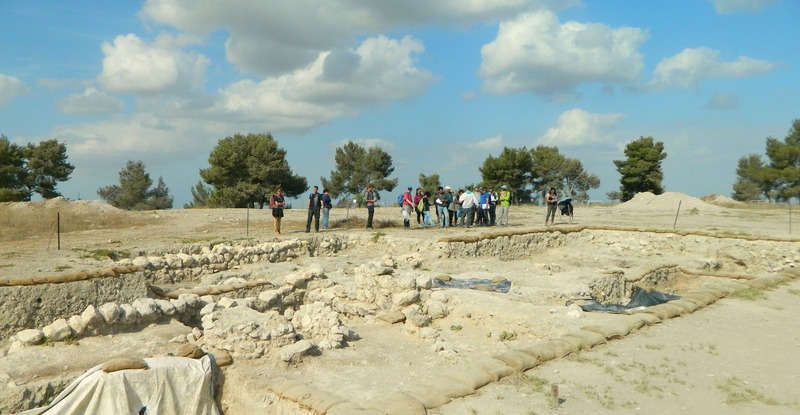 But this time I was to explore the half I hadn’t known about at that time, and to contribute to an excavation under the auspices of Dr Uri Davidovich, Ido Wachtel and Roi Sabar of the Hebrew University. 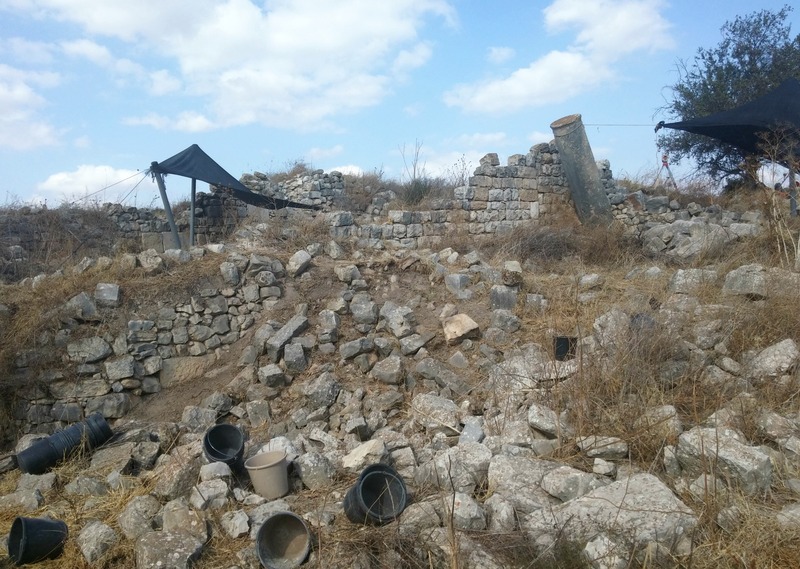 This was to be my second archaeological dig, the previous one also under the behest of the Hebrew University at Khirbet Arai near the city of Kiryat Gat. I had emailed the team in advance and so when we arrived on-site in the morning, they already knew that I was a student of Archaeology at Bar Ilan University. 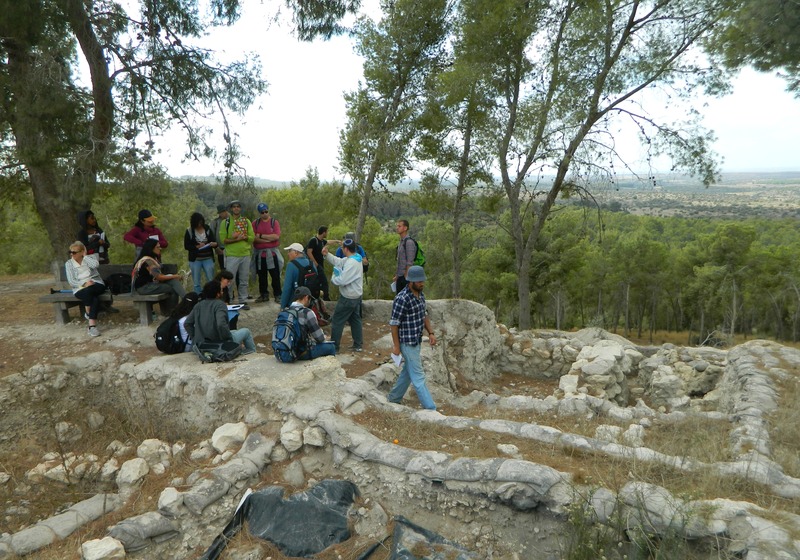 Our group of archaeologists, students and volunteers gathered in the Tel Kedesh park parking lot and received our briefing before taking the necessary equipment up to the dig site on the northern mound of the hill. On my second trip up, I stopped to watch Asaf Ben Haim uncover what looks to be a architrave and/or frieze of an important Roman building, located on the path to the dig site. As I watched him tear up the dry earth I saw what looked to be a tarantula near his hand – but no, this was a camel spider, not a true spider but a true fright! Pelicans soars in unison overhead as the sun climbed, the site slowly being turned into an archaeological excavation. As it was the very first day of the dig, in a place never excavated before, there was a lot of surveying, plotting and photo-taking to be done. At last three “squares” were decided upon – one inside the ruins of a building and two adjacent to the eastern wall of that building. The leaning column and large ashlars (Roman-looking) made this site a good place to start. To give a brief synopsis of Tel Kedesh’s history: Originally a fortified Canaanite city, the Israelites took it over and eventually made it a “City of Refuge” (alongside Shechem and Hevron on this side of the Jordan River). Later, the Assyrians captured and destroyed Kedesh along with other keys cities in the Galilee, perhaps most notably, Hazor. The Greeks, and subsequently the Romans, took up occupation renaming the city Cades. 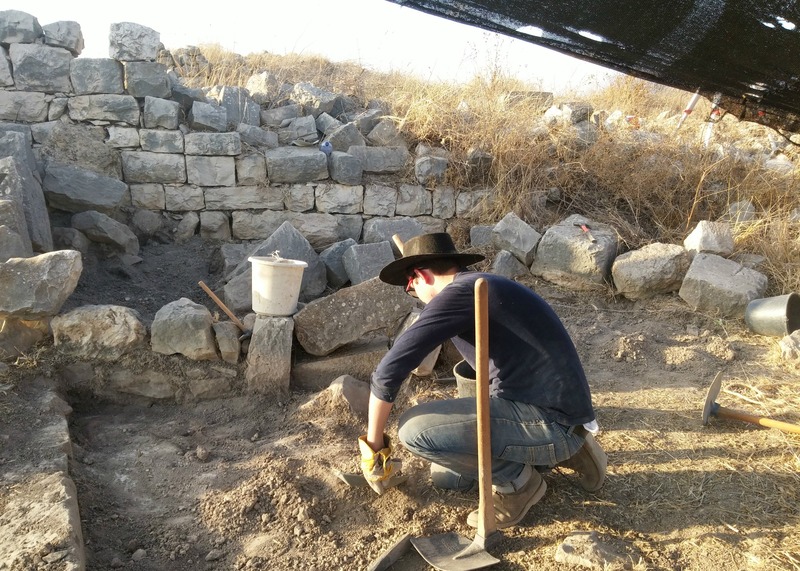 Excavations of a Hellenistic administrative building on the southern mound were done recently by the University of Michigan’s Kelsey Museum of Archaeology. 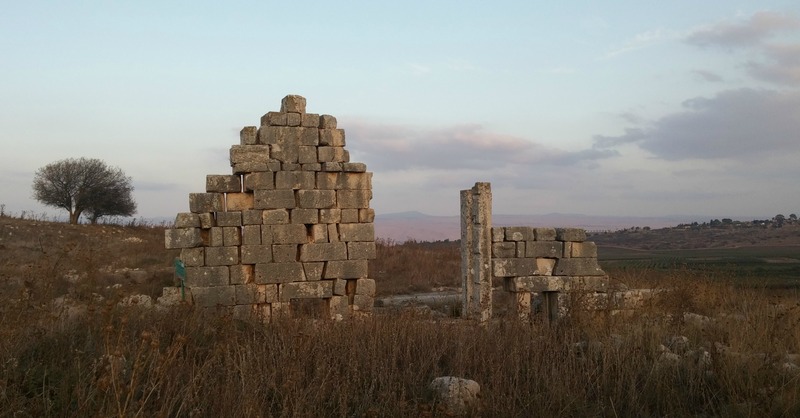 An Arab village named Kadas was established, built upon the Roman remains, and was abandoned in 1948. Remains of British rule include two pillboxes along the road to the west and a Tegart fort under the name Yusha or Metzudat Koach to the east. The Hebrew University archaeological team has its eyes set on Roman ruins so we had to clear away the dry/dead vegetation and fallen stones. Whilst clearing vegetation I found a bone in the dirt and took it to be examined – it seems to be a scorched sheep knee bone. It was the first find of the day, stashed away in a bucket soon to be filled with more bones, lots of potsherds and even a Roman metal clothespin of sorts. 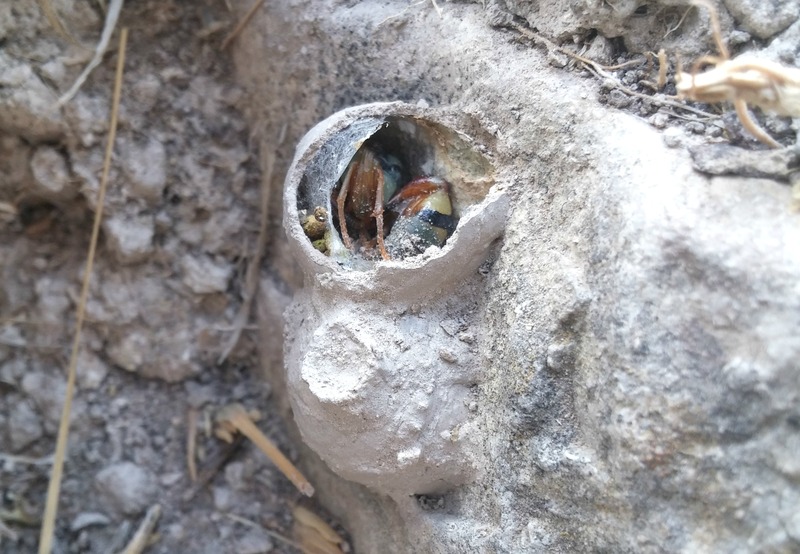 Even while at an archaeological dig I cannot help but be curious as to the flora and fauna to be seen. I spotted what looked to me like a good ten or so black kites wheeling overhead, the droppings of a porcupine (which I have yet to see in Israel), two clay capsules holding wasps in their late stages of development and my first sighting of a few Sardinian warblers popping in and out of the dry undergrowth. When lunch break came around I sat under a bitter almond tree and decided to have a taste. I don’t recall ever eating a bitter almond; the taste is just like amaretto albeit much more bitter, hence the name. 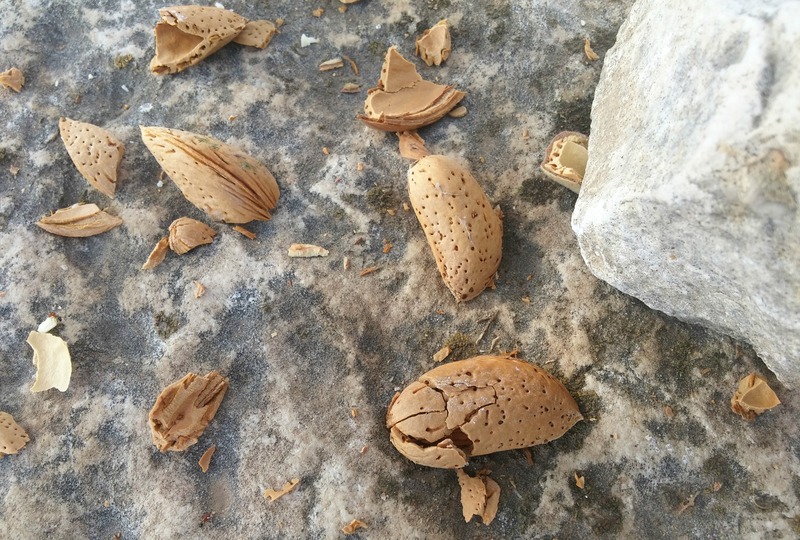 Bitter almonds have forty-two times the amount of cyanide than the normal sweet variety which means that fifty or so bitter almonds can provide a lethal dose of cyanide poisoning. After the lunch break I left the square of rock clearing and joined my brother under the field shade-tent in his square. He was wielding a small pick, clearing dirt and small rocks from alongside the base of a wall. I grasped a larger pick and we went to town on the earth and rocks of the square, clearing out a nice corner. With the sun slowly slipping off to the western horizon the productive workday came to an end and after making our way back down the hill, we took a quick look at the ruins at the eastern mound. Getting back into the car we drove back home, tired but happy to have been among the first to break ground on a new excavation site. If anything is ever found in that part of Tel Kedesh, we’ll be able to boast that we were there the very first day.